This forklift features the same ergonomic, safety, power and performance features as the larger CGC60/70 model series. This cushion tire lift truck works best in tough indoor applications, such as paper roll handling, processing mills, machinery movers, warehousing and manufacturing. Lift height is determined by mast specification at the time of order. 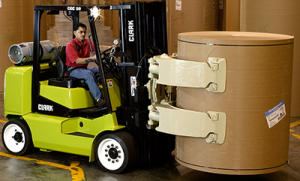 Many forklift attachment options are available. The hydraulic cushioning results in quiet staging and minimizes shock and vibration. A simple, easy to manage system. The transmission automatically disengages to prevent the truck from moving on its own, an added safety feature. Auto Shutdown protects the truck in the event excessive coolant or high engine temperature. “Double Shear” design is a simple, double-ended cylinder.